One question we are often asked is ‘What’s the difference between Close Board Fence Panels and Waney Lap Fence Panels?’ here’s what we say. Sometimes known as Overlap or Larch Lap Fence panels are probably the most popular fence panel in the UK. The thin rough sawn boards almost always retain the bark from the tree on each of the edges. The boards are then horizontally overlapped and framed with a rectangle of timber battens, sometimes to both or one side of the fence. The top is finished with a top cap for added protection. Almost all waney lap fences are manufactured untreated and then dip treated in preservative at the end. Waney Lap Fences are ideal for boundary fences and provide a good screening solution at a lower cost. However Waney Lap fences aren’t always as strong or a durable as the close board fence alternative. 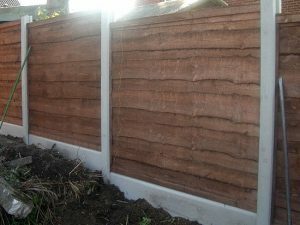 Often Close Board Fence Panels are described as ship lap or feather board fences referring to the type of construction and or the cutting of the timber. The close board fence panels are built using pressure treated vertical feather edge boards, each board is partially overlapped and secured to a number of horizontal wooden arris rails. The close board fence panels are used traditionally as a stronger and more durable alternative to waney lap panels. Although the initial cost of close board fencing is often more, in the long run they can easily prove to be a much more economical solution due to the improved durability. Close board fencing is more versatile than waney lap as more decorative features can be integrated such as arches and trellis. 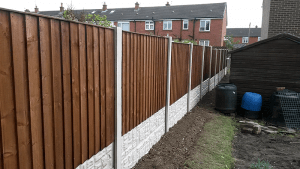 From waney lap to close board fences – Advanced Fencing of Wigan. No matter what you choose we’re always happy to help, from ordering fence panels to installation we take care of it all.